There are an understood set of popular themes for games that show up across our favorite titles - space, The Renaissance, exploration, nautical combat, high fantasy adventures, wild west showdowns - if I put up a poll, I bet I could get 20 examples of games that fit those themes. But what about quilting? 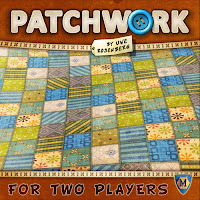 Patchwork is a two-player game about making a quilt. It's not a zombie quilt, or a space quilt, or even a magic quilt for Dwarves that live in a cave. It's a regular quilt, and you probably won't even finish it. You'll have some holes left, and it will be covered in buttons (??? ), and you'll feel so zen while you're doing it that you'll never poke fun at your grandmother's habits again. With that, I invite you to join me as I explain why Patchwork is one of my top-five games this year. 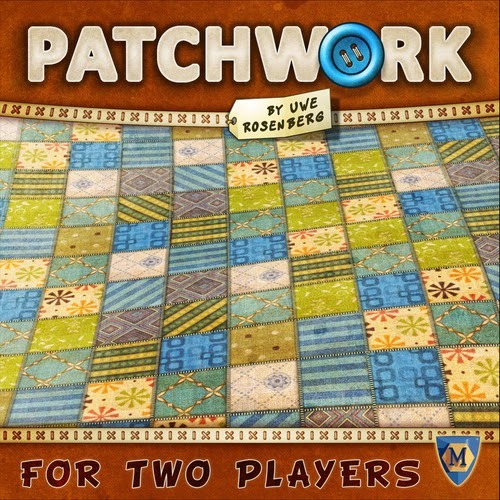 In Patchwork, two players compete to make the "best" quilt by gathering buttons and spending them to acquire various patches of mismatched material. These pieces are reminiscent of Tetris pieces, though with significantly more diversity in size and shape. 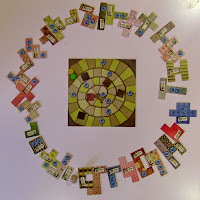 As players take their turns, they slowly advance their game pieces towards the inside of a spiraling game board, called the "time track", gathering additional buttons and small patches to fill in the holes in their quilt. Image credited to Phoebe Wild. The game ends when both players have reached the center of the game track, at which point each player adds up their total buttons and possible bonus points, then subtracts two points for each uncovered space on their quilt board. The player with the most points is the winner! For a full run through of the game and a link to the rulebook, see the links at the bottom of this article. To begin, each player takes a quilt board and places their colored token on the start space of the time track. Then the patch pieces are randomly placed around the time track, creating a circle of pieces, one after the other. The neutral token is placed just after the 2-square patch (the only one in the game), and players are given 5 buttons each. Take one of the three patches directly in front of the neutral token, then pay buttons equal to its cost and advance their game piece towards the center of the board by the amount indicated by the patch's time cost. OR advance their game piece on the time track until it is one space past the other player's piece, then collect one button from the bank for each space travelled. Because the active player is always the player who is "behind" on the board, it often happens that a player takes two or more turns in a row. This is a crucial aspect of the game, especially as the number of available patches decreases and the game is almost over. There are a number of spaces on the board with printed buttons. Whenever a player passes one of these spaces, that player counts the number of buttons on patches on their quilt board, then takes that many buttons. These buttons are the currency of the game, and this is the only way to get more buttons (besides passing the turn and advancing your game piece). 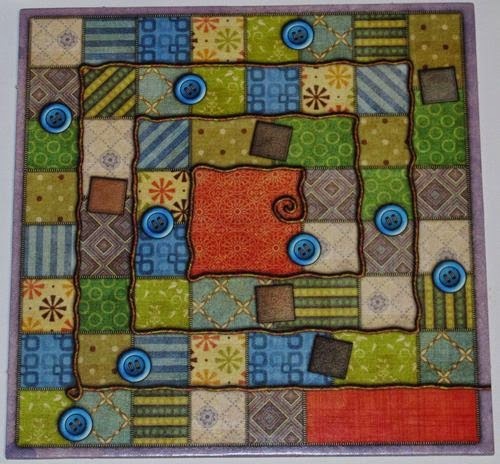 The first player to cover a 7x7 area on their quilt board get a 7-button bonus. I've won games with and without this bonus, so it isn't crucial to victory (though final scores are often in the low 20's, at most) but it does provide players an initial direction: try to cover a slightly smaller area than the whole game board, which is 9x9. Patchwork works because there's something engaging, almost hypnotizing, about putting Tetris pieces on a board and planning for the next move or two. It's a delightful example of hidden depth in a game - there's definitely more strategy to Patchwork than is immediately obvious in your first game. It's difficult to see it at first, but the random order of the patches at the start of the game creates bottlenecks and scarcities in certain piece costs and shapes that absolutely determine who wins. It's a wonderful example of elegance in design - simple rules that lead to complex game play and interesting choices. The quality of design isn't surprising, given that designer Uwe Rosenberg's most popular games, Caverna, Agricola, and Le Havre are rated #4, #6, and #13 respectively among all games on BoardGameGeek. I love that Lookout/Mayfair was willing to publish this game as it's something different than Uwe's larger, deeper Euro-games. Did I have fun when I played this game? If so, why? When I played the game again, did I enjoy it more, or for different reasons? Was I surprised by some part of the game? Does the game consistently deliver the experience it promises? These are hard questions to answer sometimes, and it's easy to pick apart the merits of my evaluative measures, but they work well for me. All of this is to say that Patchwork is a flexible game that can deliver a different type of experience depending on the engagement of the player, and both experiences are really enjoyable. It's consistent in that delivery, meaning that each time I sit down to play, I expect a certain kind of feeling and fun, and each time I've gotten it. I've played it 10 times now, and enjoyed it each time. 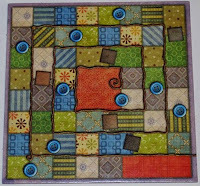 As a related aside, there is no randomness in Patchwork once the patches have been placed in a circle around the game board. In some cases a lack of total randomness, as well as a lack of any hidden information, can lead to "alpha gaming", where one player plays for both, and/or makes suggestions as to "best plays" during the game. I found myself doing this to Amy (my wife) until she called me out on it. This specifically reminds me of Mr. Jack, another excellent two player game, which can, near the end of the game, turn into a puzzle whose solution is available for both players to find. If you're a player who tends to do this, and you've got a partner who tends to be annoyed by it, be warned! I'd recommend Patchwork to any gamer, anywhere, period. The game is wholly language-independent, requires no math beyond counting buttons, and can be played casually for the simple joy of creating something pretty, or competitively as an exercise in careful planning and tactical execution. It's perfect for a couple looking for a fun game to play together, or for a game group looking for something to end the night with. At $25 MSRP it's a great value for the depth and replayability of the game. Go check it out!